Barracuda Yacht Design, the Madrid-based naval architect, has gone into uncharted territory with its latest concept for a 65m explorer yacht with military bite. Form and function are the bywords of the ‘go-anywhere’ Explorer Barracuda 65m, an ice-class approved design with living space and accommodation amenities that one would normally associate with an equivalent length superyacht. Barracuda owner Inigo Toledo certainly revelled in the freedom of being able to work from a ‘blank canvas’ following an initial inquiry from a well known shipyard looking for innovative ideas based upon a “purpose-designed” explorer. The most notable aspect of the design is the vessel’s military styling, with prominent bow and double-chine effect that would be capable of handling rougher than normal conditions, while keeping decks as dry as possible. As Mr Toledo pointed out, military vessels are by definition “practical and fit for purpose”, a leitmotif that Barracuda adopted, eschewing all forms of frivolous styling. 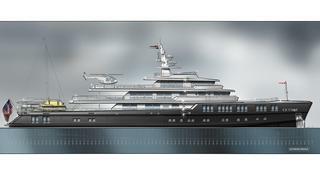 The exploration deck, with multipurpose crane, has room enough for carrying two superyacht submarines, a quick deployment tender and two Jeep style vehicles, and a large enclosed garage houses two further limousine style tenders and four PWCs. The dual personality of the design is exemplified by way of the beach club with large swim platform and dual side-opening doors, while nearby the helipad is certified for a full utility, explorer’s helicopter. Main deck accommodation comprises four guest cabins and a VIP suite accessed via a central hall. Behind that, a large internal lounge and dining area leads through to a spacious external patio. Above this on the upper deck the owner has his/her suite with private terrace. The deck space is shared with that of the captain’s cabin, conveniently situated next to the bridge. The sky lounge is where guests can enjoy panoramic views. Mr Toledo said that a combination of hydrodynamics, fuel efficiency and refined structures made it a distinctly Barracuda design, which he hoped would be used as a template for similar vessels in future. With a top speed in the region of between16 to18 knots and a cruising speed in the region of 14 knots, the Barracuda 65m is a capable long-range cruiser with a range of up to 7,000nm – distance enough for the most adventurous owner to go boldly where few have been before, and with the utmost confidence.